PBG Limitless Rent a car in Lefkada. Greece. Rent a car in Lefkada or Lefkas is a touristic destination with many places to see and things to do. Rent a car from PBG Limitless will make your stay a lot easier and more enjoyable. The Ionian island of Lefkada (Lefkas) is a very beautiful one, situated close to the region of Etoloakarnania on the Western Greece. Considered as the Caribbean of Greece, Lefkada Island amazes visitors with the exotic blue colour of its beaches. Connected to the mainland through a small bridge. Lefkada can actually be accessed by car or scooter so there is no need for ferry. That is perfect place for families. But also for couples. They have something for everyone. The beaches, on the western coast of Lefkada Greece, distinguish for the wonderful colors. The impressive landscape, particularly Porto Katsiki, Egremnoi and Kathisma. Around the island, visitors can find lovely villages with fish taverns. Always by the sea and surrounded by lush greenery. Vassiliki, Sivota, the Town and Agios Nikitas are beautiful places with special character each one. Rent a car in Lefkada or Lefkas and discover all about it. There is actually a small moving bridge how connect the island to the mainland. Naturally beautiful with inspiring landscapes and stunning scenery. Lefkada is a very popular holiday island for both Greeks and foreign visitors. 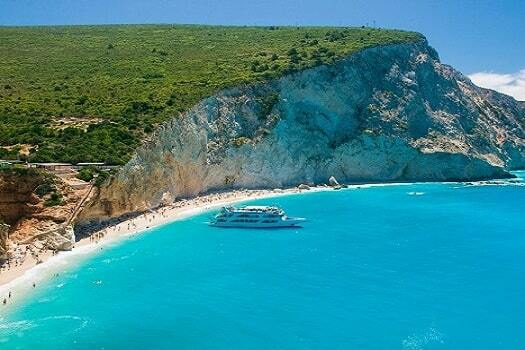 The island of Lefkada is well organized to cater for tourism. Has a well developed in frastructure with main tourist island hotspots like Lefkada city, Nikiana, Agios Nikitas and Vassiliki. Rent a car in Lefkada is well organized to cater for tourism. Has a well developed infrastructure with main tourist island hotspots like Lefkada City and Agios Nikitas. Visitors can also pass by the old church of Agios Minas, which is situated in a charming square in the commercial centre of the town. There you can enjoy a meal or a drink at one of the traditional taverns and bars. Lefkada has magical beaches for all kinds of taste. Immense sandy beaches that will surprise you with their wild beauty like Porto Katsiki, Egremnoi and Kathisma, but also beaches for calmer family situations like Ai-Yiannis and Vassiliki to windsurfand kite surf. Situated about 3km outside town is the charming “Faneromenis” monastery, which was built on a very beautiful area. Visitors to Lefkada will find a wonderful selection of accommodation including hotels, rooms, studios and apartments to let all over the island. Lefkada has flight connections via the airport at Aktion (PVK), as well as regular national coach services (KTEL) to Athens and other major Greek cities. There are also ferry services that can take visitors to the neighboring Ionian islands of Cephalonia and Ithaca. Contact us today for your Lefkada Rent a car needs. Rent a Car in Lefkada | How much is the cost of Rent a car ? If you are book 3-6 months before you can get full insurance free. Due to early booking get 30% Discount. So, we have full insurance & 30% Discount. as a result the best rental in PBG rent a car is if you are book soon enough. Almost 41% of customers due to this offers save even more. So, If you are looking for rent a car in Lefkada, is more easy than ever. Pick up your rent a car from PBG Limitless & you are 100% Covered!